John Lee Smith, better known as Big Smo, was born in San Diego, California to mother Mary Jane Smith and US Navy Veteran Carl Avery Smith. His older brother was always called “Sma” so people started calling him “Smo” and the name stuck. His father passed away when he was young and had a major impact on Smo’s life. He began to take an interest in music at a young age and learned to play piano and the drums, later joining the drumline and writing poetry in high school. Growing up he was exposed to both country and rural music. He decided he wanted to combine both genres and create his own country rap, often referred to as hick-hop. Soon after high school, John Lee Smith began DJing as well as writing and collaborating with Ray Riddle, better known as Orig the DJ. 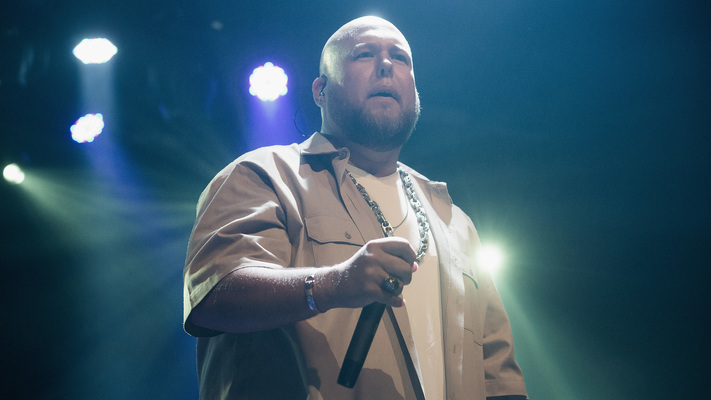 His first major hit, "Kickin’ It In Tennessee," received over 5 million hits on YouTube and gained the attention of the Senior Vice President of Warner Bros. Big Smo soon after signed with Warner Bros. and released his hit album Kuntry Livin’ in 2014. Since this album, Smo has continued to release music, including two more albums with Warner Bros, We the People and Special Reserve. Big Smo has made several reality TV appearances including television series Big Smo, a program showing his life on his family’s farm.